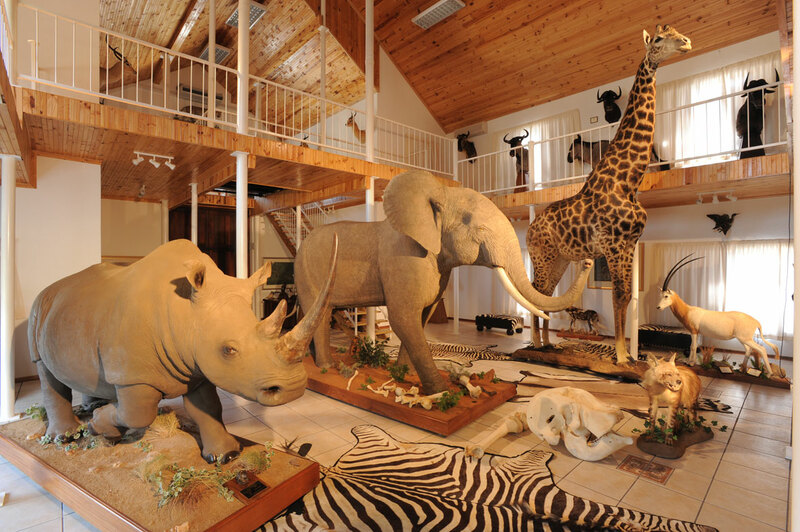 At the beginning of 2012, the Iziko Museums of South Africa in Cape Town contacted me and asked whether I would be prepared to donate them the mounted animals in my “museum” on our old game ranch, Bankfontein, in the Eastern Cape of South Africa. I had a number of meetings with the CEO of the Museums, Ms. Rooksana Omar and her staff and was impressed to hear that they were about to start a R320 million (about $40 million) building program called the “Courtyard Project” to expand and modernize the museums, which was due to be completed in the next three years. A number of people and institutions had previously asked me the same question but, on closer examination, either the request faded away when they realized what housing such a collection would entail or they could not make up their minds as to exactly what form the offer to me should entail. Never have truer words been spoken than by the person who said that camels were merely horses designed by committees! 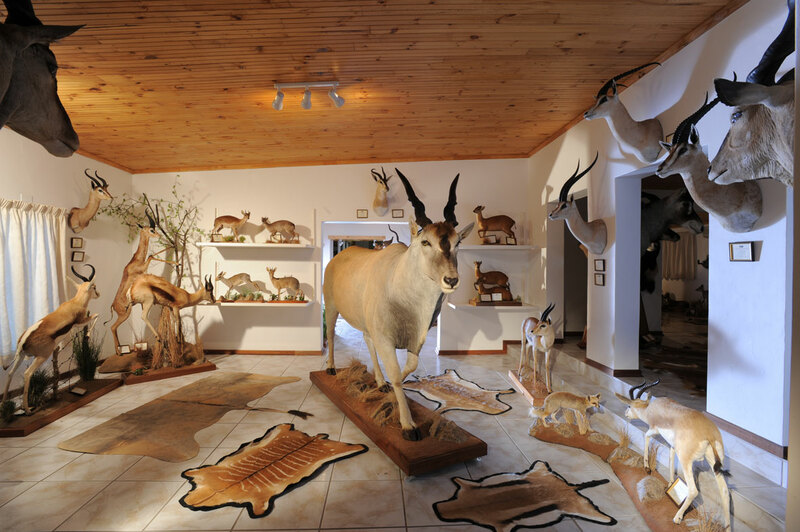 The collection on Bankfontein consists of over 300 taxidermied specimens, of which over half were full mounts and included every game animal in Africa currently available on license, with the exception of nine animals comprising mainly forest duikers. 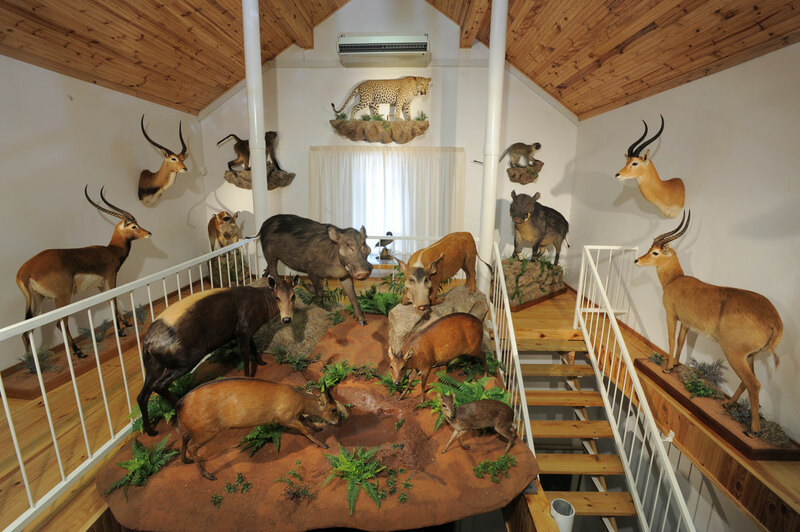 The collection had been valued for insurance purposes at over R12 million (about $1,5 million at the time) and the taxidermy costs alone exceed R2 ½ million (over $300 000 at the time). 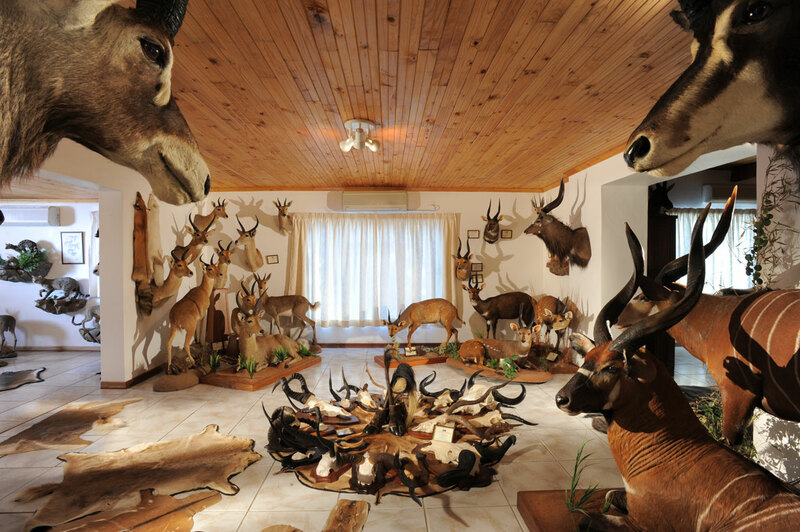 I spent four days on Bankfontein anxiously watching the very professional team from the removal company, Biddulphs, wrapping, packing, crating, loading and, finally, moving the entire collection in four huge removal vans plus trailers to Cape Town. Once there, it took a further two full days to move the mounts from the trucks into the museum where some of the major pieces would be on display initially until the Courtyard Project was completed in approximately three year’s time. At this stage, the bulk of the mounts would go on display. 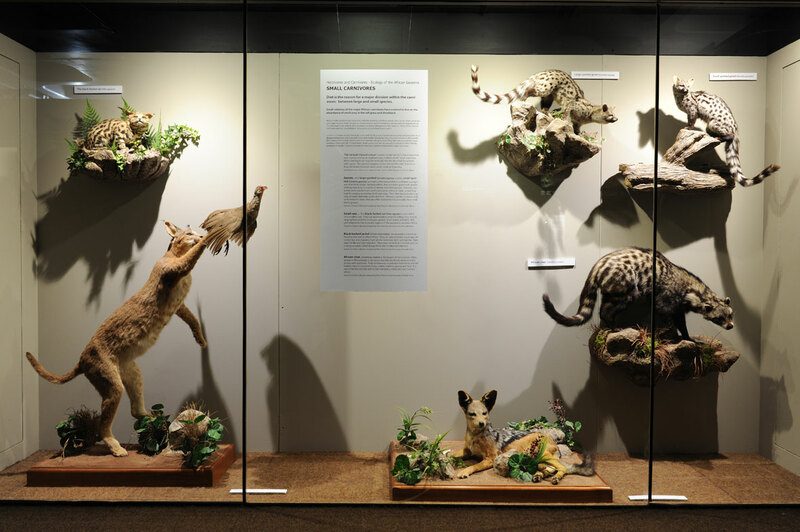 Nearly five years later, the Courtyard Project is still not complete but some 50 of my mounts are currently set out in a display entitled, Herbivores and Carnivores of the African Savannah. 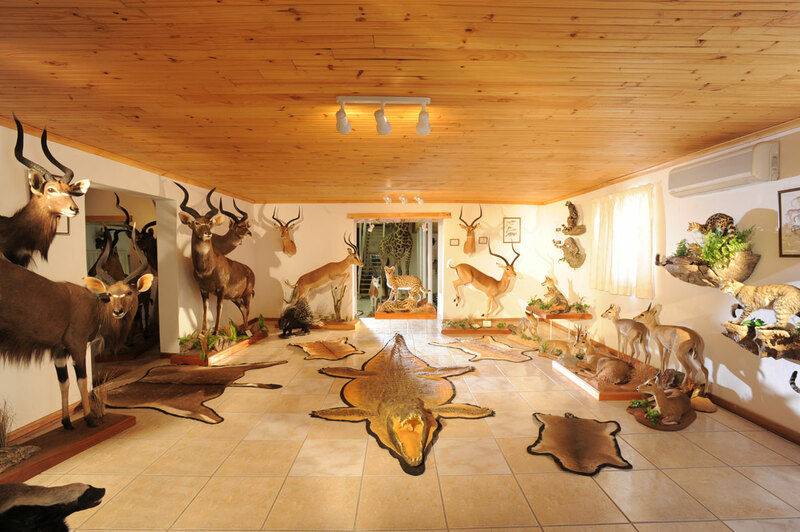 MAIN HALL WEST: This is the largest of the eight rooms making up my trophy rooms or what my friends now call the museum. It was designed by Alain Lefol after he came to recuperate with us after being released from a Chadian goal after he was wrongfully arrested for defending himself when speared by a nomad. SABLE & BONGO: When I shot the bongos they ranked number 1 and 12 respectively in Rowland Ward’s records of Big Game, The roan on the left was also the third largest ever shot in South Africa but I shall have to wait for the next edition due out in a few months time to see where they rank now. 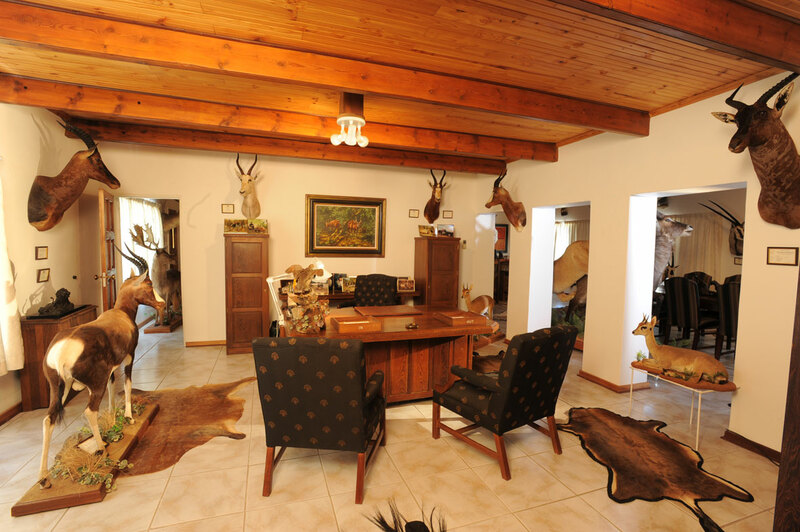 BOARDROOM EAST: This is the boardroom in the museum and contains Arabian, beisa, beisa and scimitar horned oryxes on the left and common, sing-sing, common and East Africa defassa waterbuck on the right with the lioness climbing on to a Crawshay’s waterbuck full mount. 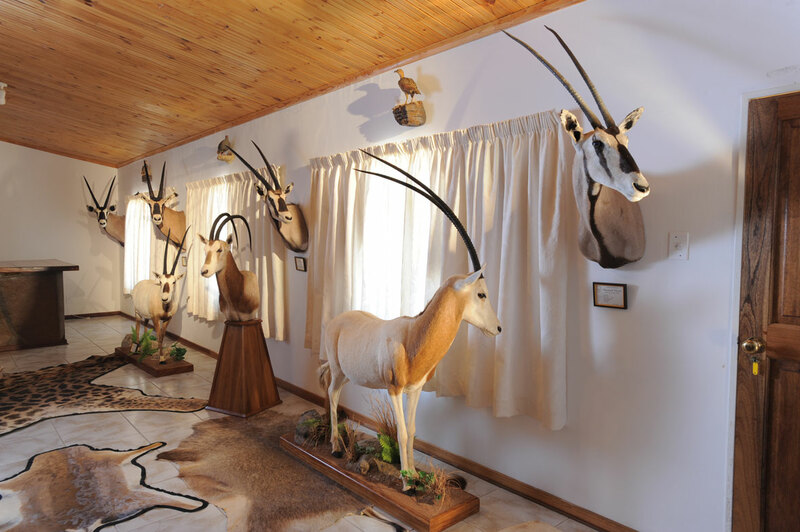 BUSHBUCK & REEDBUCK: On the left, all the reedbuck subspecies including Nagor, Bohor, common and mountain varieties currently available on licence. On the right, five of the eight bushbuck subspecies currently available on licence with two big bongos in the foreground. DUIKER & CATS: All the bush duikers in the centre and a very large East African impala full mount in the corner. 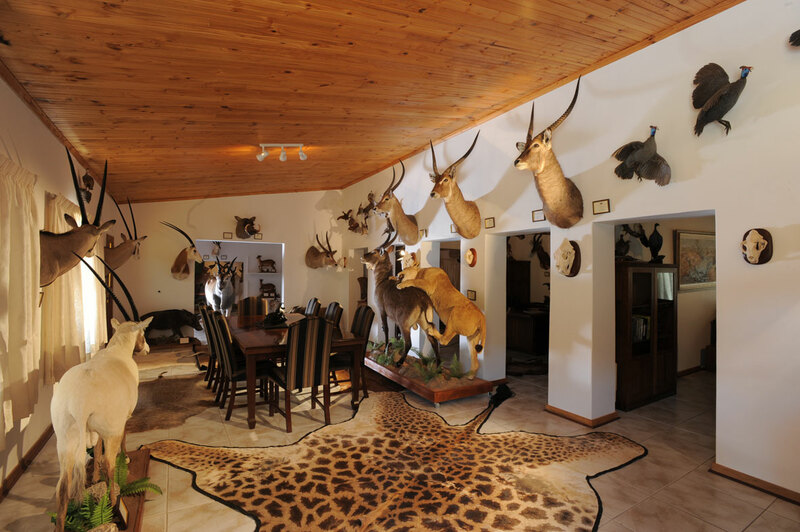 ELAND EAST: This room contains all the different eland and gazelle subspecies currently available on licence. ELAND WEST: All the eland subspecies with the exception of the Western giant eland which is no longer huntable. From left to right – Lord Derby’s, Cape, Livingstone’s and Patterson’s. FOREST ANIMALS EAST: Two giant forest hogs, two red river hogs and then from left to right – yellow-back, Peter’s, blue and bay duikers. The red river hog in the foreground was supplied by my friend, GT Ferreira and the yellow-back was bought from a PH. 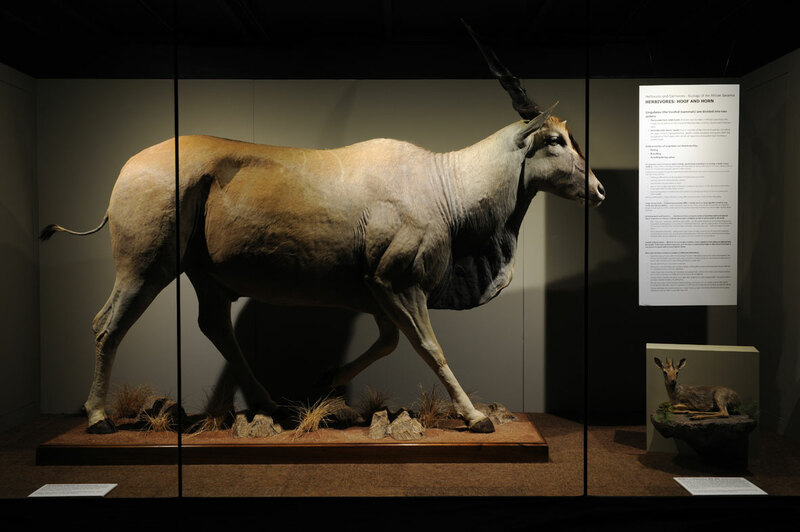 GEMSBUCK & ORYX: From left to right – gemsbok, fringe-eared, Beisa, Beisa and scimitar-horned oryxes with Arabian (white) and scimitar-horned full mounts and a scimitar-horned pedestal mount. 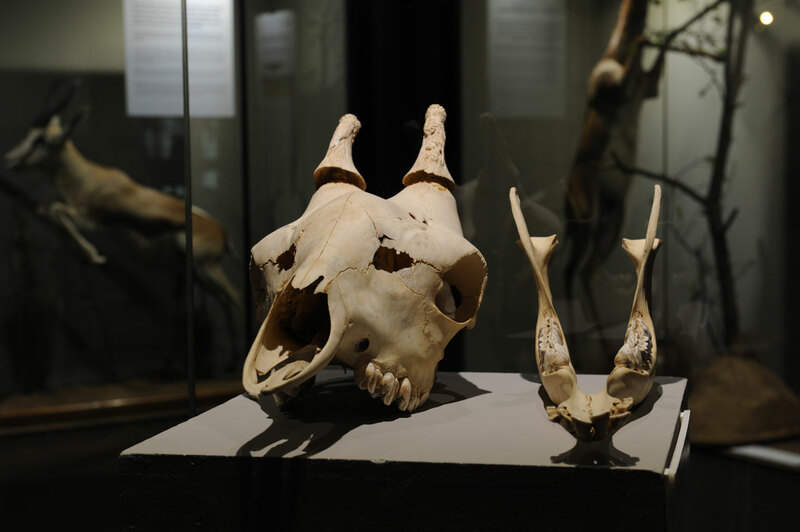 IMPALA & NYALA EAST: Two common nyala and two mountain nyala on the left with the three different impala subspecies – two southern impala shoulder mounts, black faced on the left and East African on the right. 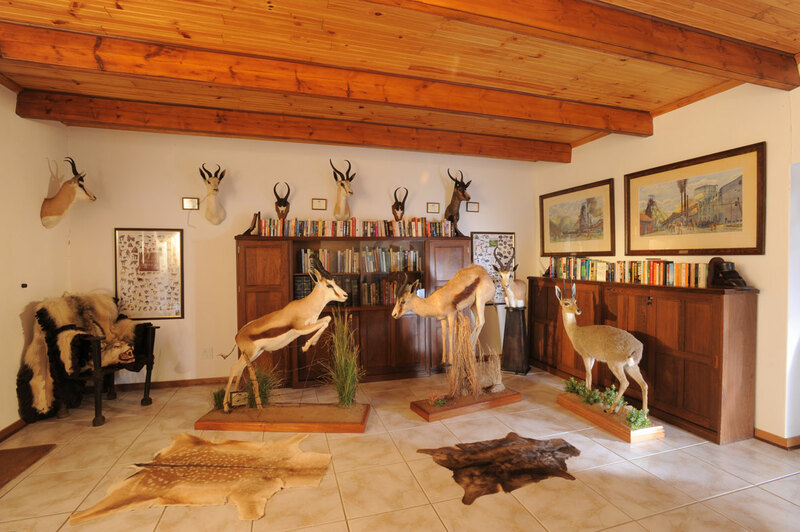 JANES OFFICE EAST: All the different colour phases of springbok and a good vaal rhebok shot on Bankfontein while filming Flack Hunts South Africa. 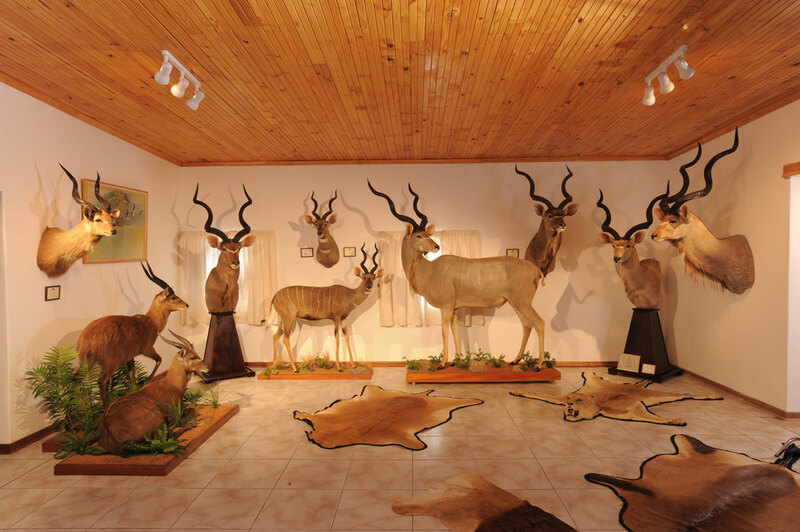 KUDU & SITATUNGA NORTH: Western, East African and forest statungas with all the different kudu subspecies. 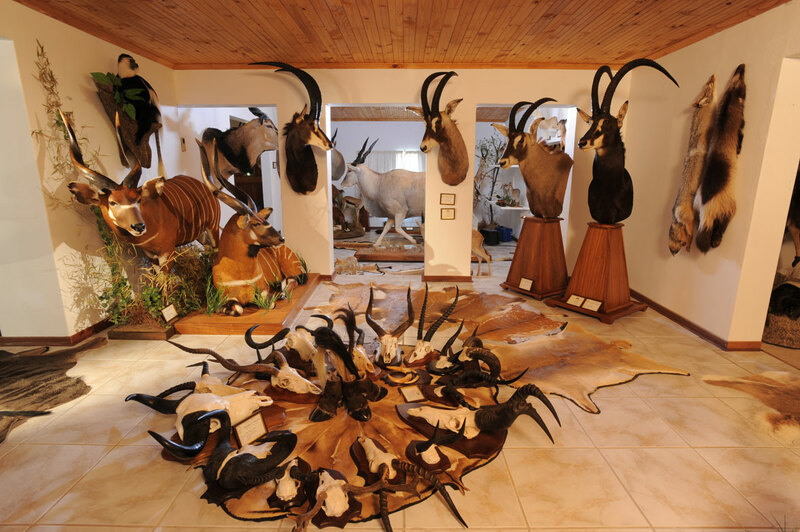 PETES OFFICE WEST: This room hosts all the damaliscs – topi, tiang, korrigum, tssessebe, blesbok, white blesbok and the full mount is a good bontebok. 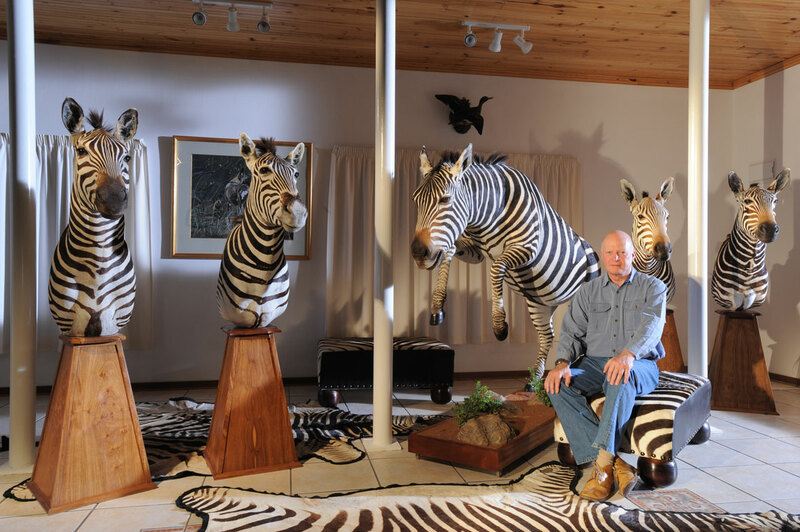 ZEBRA: Posing with different zebra subspecies. 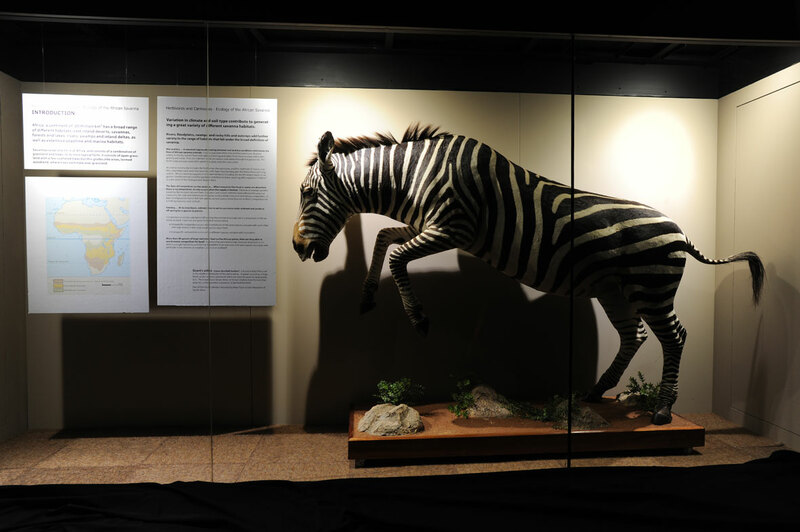 From left to right – East African and South African plains zebras and then Cape, cape and Hartman’s mountain zebras. 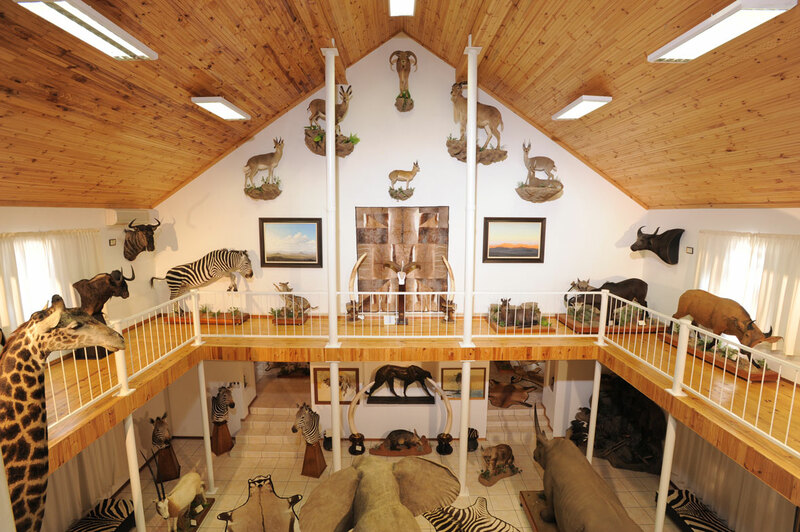 MAIN HALL UPSTAIRS WEST: The view of the largest of my eight trophy rooms seen from the upper level. 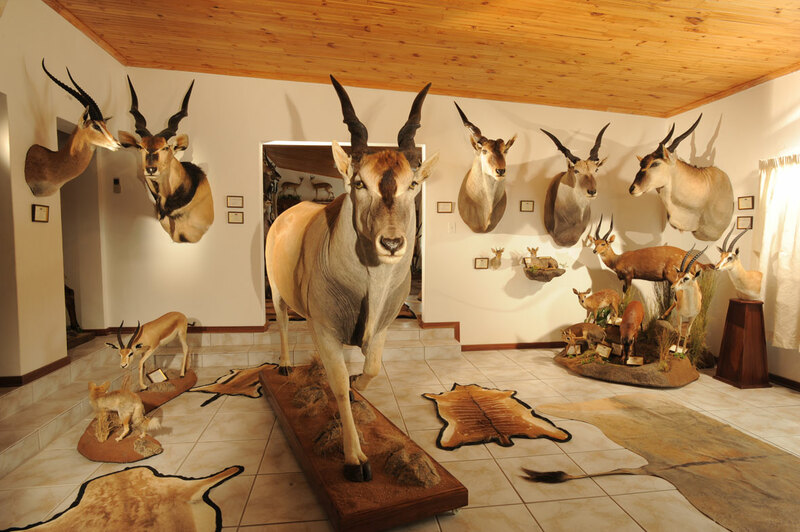 Ahead on the wall are all the mountain game found in Africa – mountain reedbuck, Nubian ibex, Barbary sheep, klipspringer and vaal or grey rhebok. Giraffe skull and lower jaw bone. 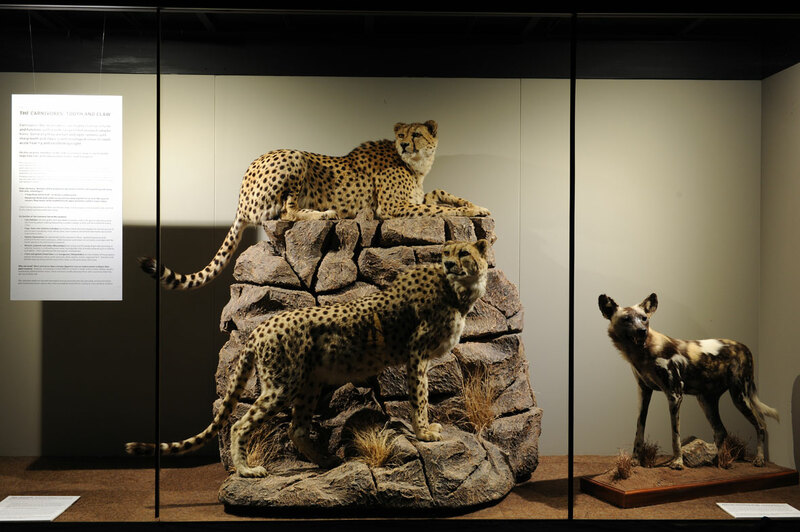 Two mature cheetah males from Namibia and a Cape hunting dog. 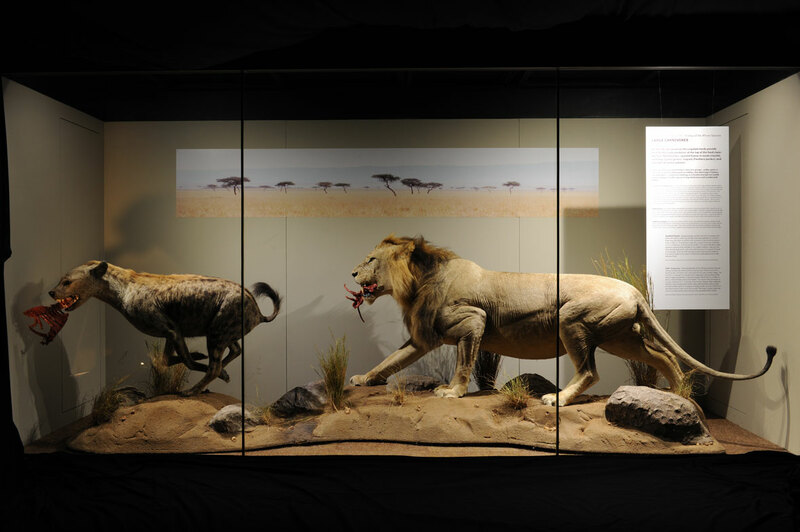 The exhibit is entitled ‘The Carnivores - Tooth and Claw’. 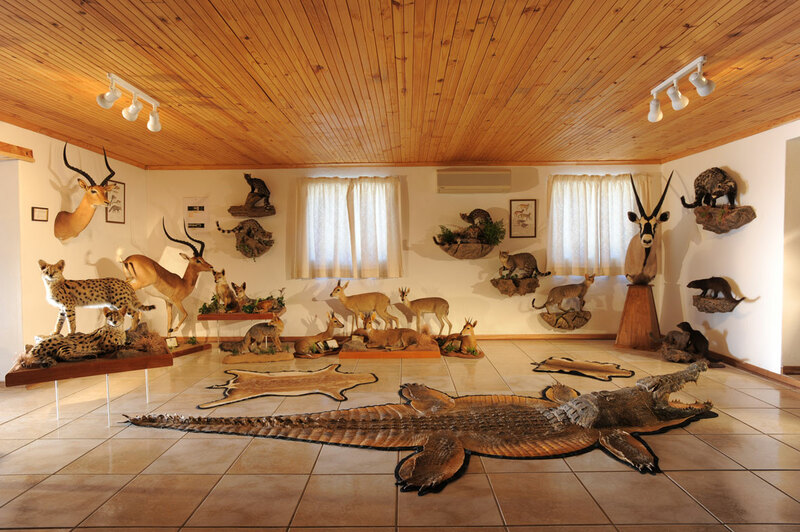 The hunting dog died in the Johannesburg Zoo and the skin was obtained by my taxidermist. 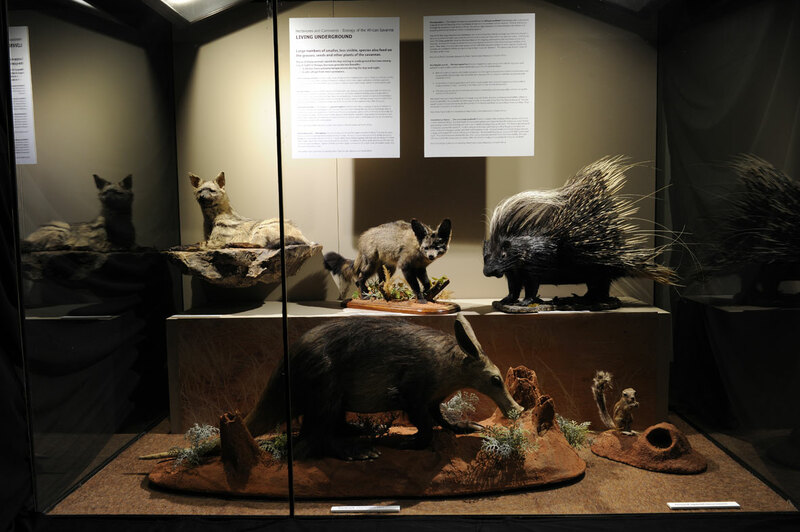 The exhibit is entitled, ‘Living Underground’ and consists of, from left to right: aardwolf, bat-eared fox, aardvark, porcupine and ground squirrel. 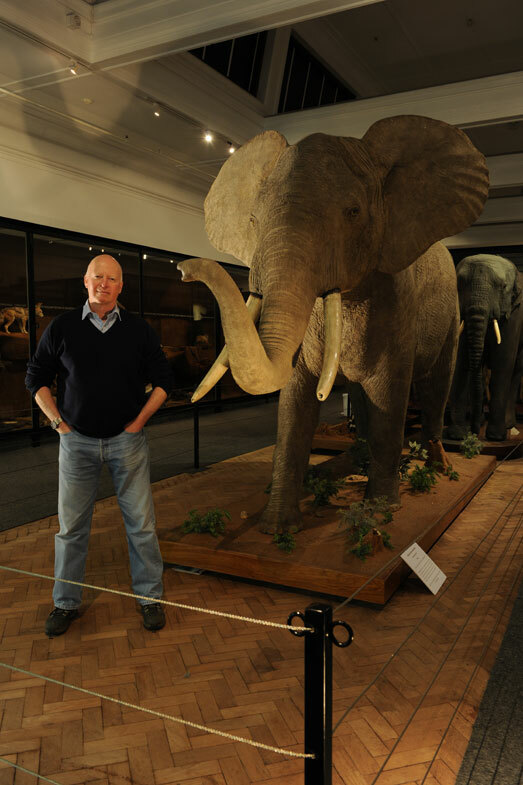 Peter standing next to a full mount forest elephant, which is a little over half the size of an equivalent savannah elephant. This one was shot in the Cameroonian rainforests and the pygmies who tracked it said it was the one that had killed their leader the week before. 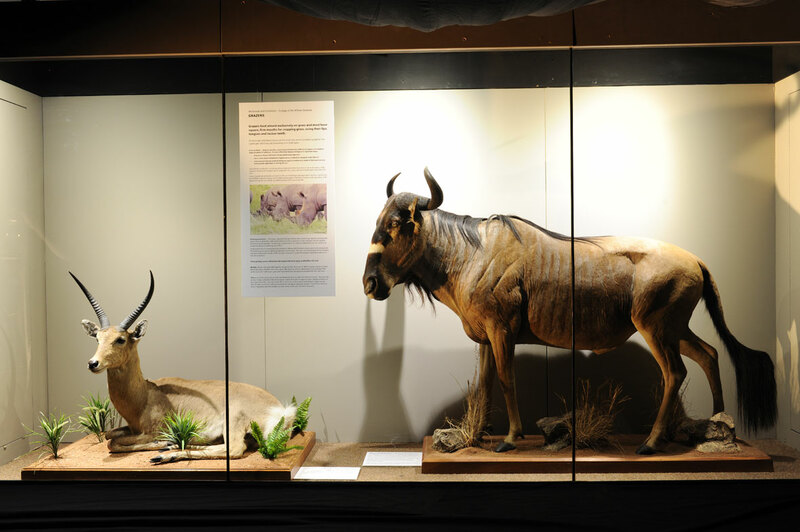 The Dam Edges exhibit consists of an Island sitatunga from the Ssesse Islands in Lake Victoria, a large grey mongoose and a Kafue lechwe from Blue Lagoon in Zambia. 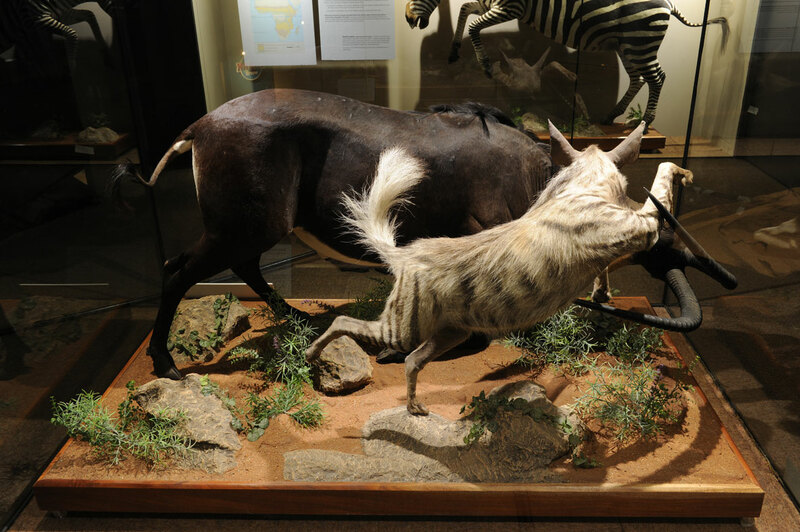 A striped hyena - one of four members of the hyena clan in Africa - attacking a Roosevelt sable named after President Roosevelt’s son, Kermit. Both animals are from Tanzania. 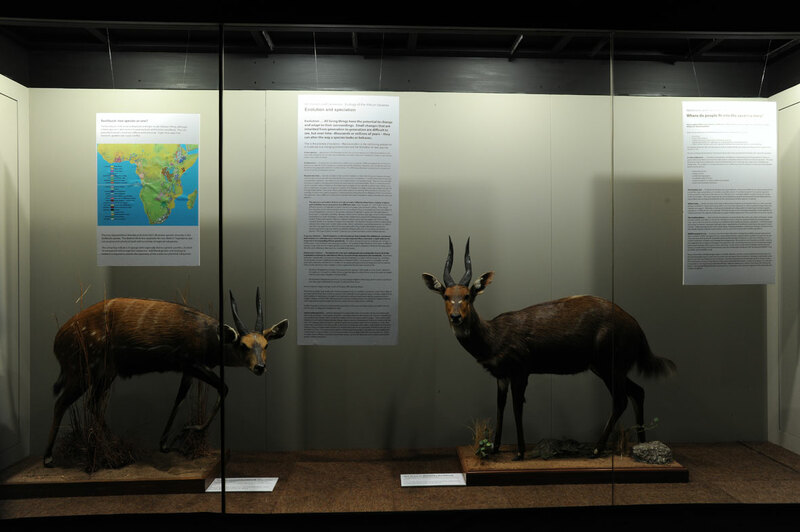 A harnessed bushbuck from the Central African Republic and a Menelik’s bushbuck from Ethiopia, two of 11 subspecies recognized by the two main international record books. A cheeky hyena stealing part of the lion’s kill or is it the other way around? 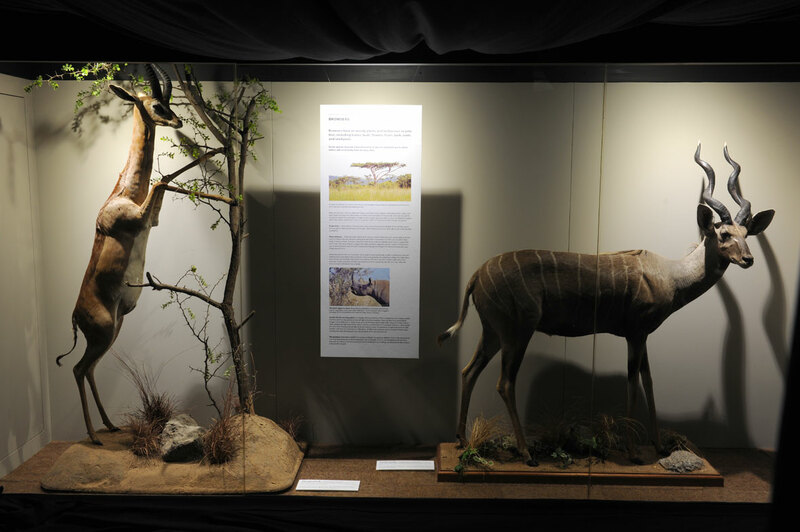 A huge East Africa impala from the Serengetti and a South African springbok, both of which are browsers and grazers as the name of the exhibit implies. From left to right: African black-footed cat – which was found dead next to a farm track - caracal, black-backed jackal, small spotted genet, civet and large spotted genet. A large Cape eland from Bankfontein game ranch on the eastern edge of the Great Karoo in the Eastern Cape province. A plains zebra from Tanzania. 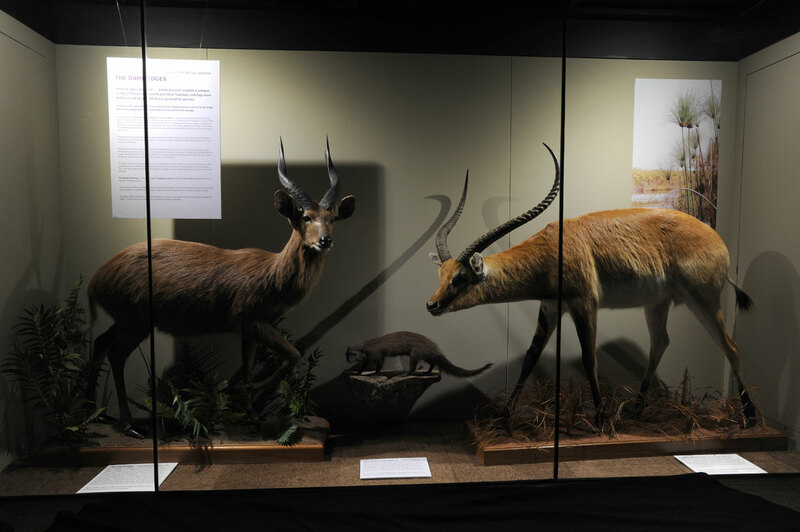 A common reedbuck from KwaZulu-Natal in South Africa and a Nyasaland gnu from the Selous Game Reserve in Tanzania, making up the Grazers exhibit. 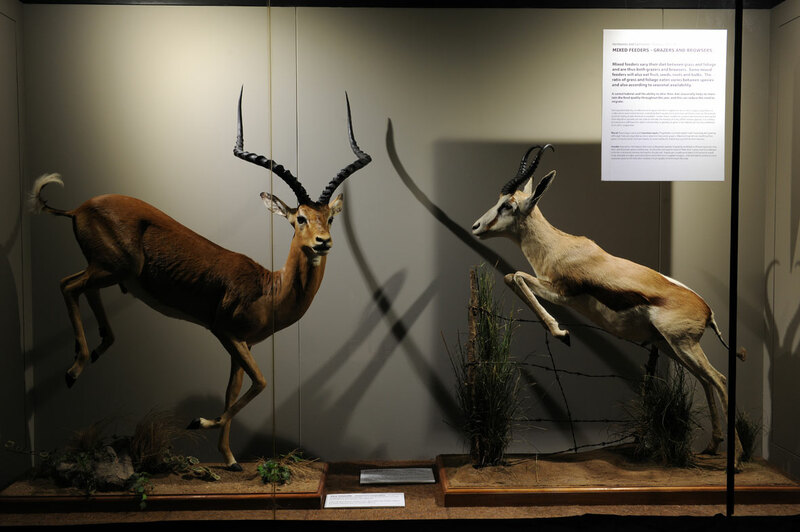 A Northern gerenuk from Ethiopia and a lesser kudu from Tanzania’s Masailand making up the Browsers exhibit. 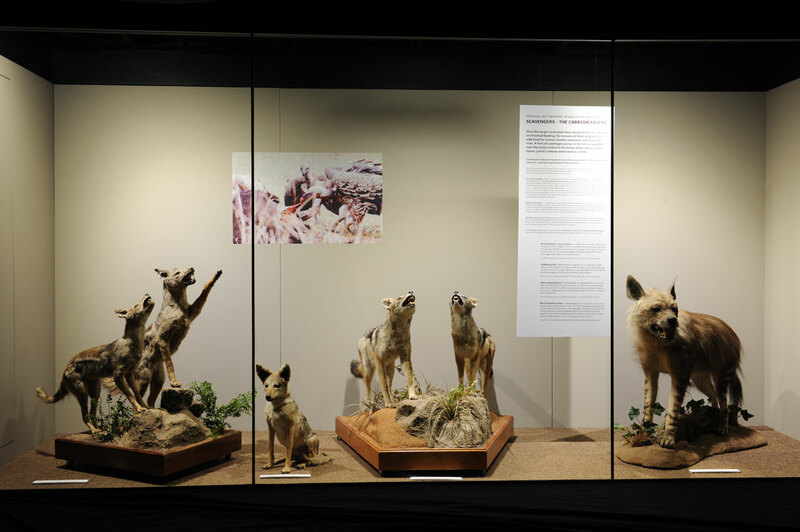 The Scavengers – Carrion Eaters exhibit is made up of two side-striped jackals, a lone sitting golden jackal, two black-backed jackals and a brown hyena. 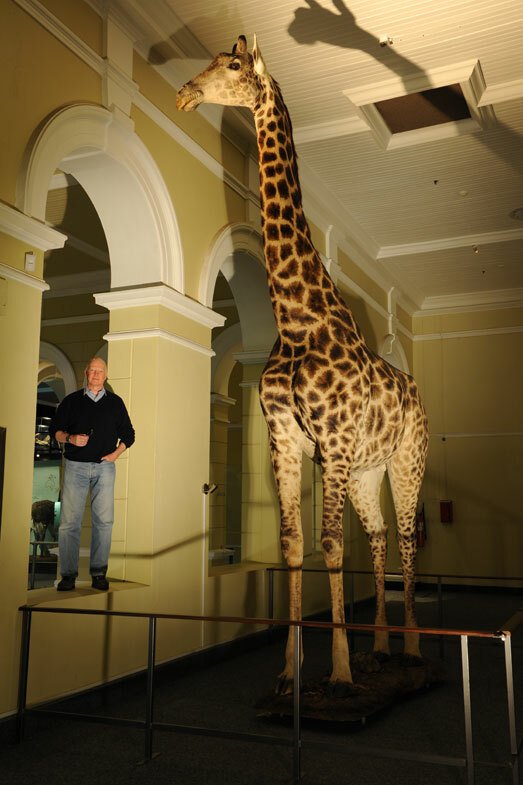 This enormous giraffe (19 feet 6 inches tall), was shot at the request of the game rancher as, on the one hand, it was killing the younger bulls but, on the other hand, not covering the cows. A lose/lose/lose situation, including for the giraffe.